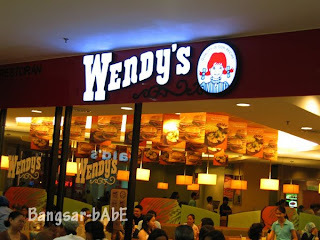 rif and I had been wanting to try Wendy’s when it opened in Sunway Pyramid. We finally got to to try it last Thursday since it was a holiday. 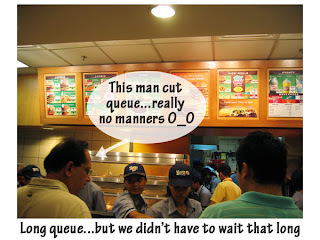 Reached the outlet at 1pm and there was quite a long queue. Ordered a medium 1/2 pounder set each and a side of chili to share. Made to order, the burger was pretty big. Two patties of beef with a slice of cheese sandwiched between firm yet soft buns; it was a VERY MEATY burger. The buns remind me of semmels (bread rolls) in Europe. 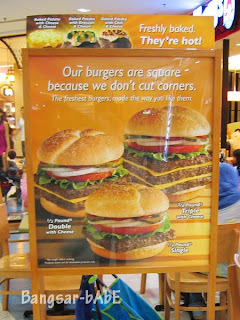 The patties are square-shaped and very juicy. I thought the chili was alright; I’ve tasted better. Made of beef mince and kidney beans, it tasted a lot like Bolognese, only less sour. I wished it was spicier though. Nevertheless, we both enjoyed dipping our fries into it. All in, it was a very meaty and gratifying meal. 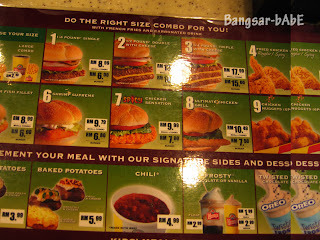 Price-wise, Wendy’s is somewhere in between Carl’s Jr. and McDonald’s with set meals ranging from RM 7.99 to RM 17.99. Good-tasting burgers and pretty big portions. I prefer the burger toppings to be fancier, like the toppings in Carl’s Jr. Next round, we plan to share the large 3/4 pounder burger set. 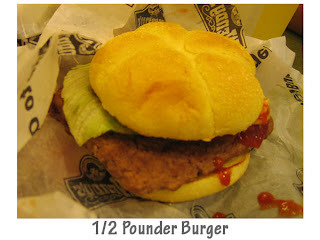 Don’t know how I can fit the 3/4 pounder into my mouth, as I have difficulties eating the 1/2 pounder already. This full-loaded meat experience cost us RM 35.67 inclusive of 5% tax. Not bad considering the quality, and quantity. Verdict: Wholesome burgers, juicy patties and reasonable pricing. Worth a try. Yes.. very meaty indeed. The good thing about Wendy is that the burgers are freshly made but the bad thing is that service is not fast. 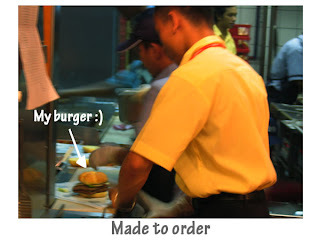 As seen from the pic, there is only one burger production line only. I think with that kind of crowd, there should at least be 2 burger production line. Yup..I agree. When are we going there again?